Looking for a place to live in? Thinking of a safer place to raise your kids? Are you looking for a home where a reputable university is near? Iowa City is a great deal for you since it houses the University of Iowa, one of the most reputable universities in the suburbs. Along with these, the city has the University of Iowa Hospitals and clinics that serve the community of its medical needs. The city has different entertainment venue and night spots enough to cater to students. Iowa City had been listed as one on the top list city for doing business in the U.S. The cost of living is affordable and job opportunities can be seen left and right. By the way, the ACT college testing service is settled here. Have a heart for oats? Well, Cedar Rapids has a large Quaker Oats mill. Other large companies have facilities in Cedar Rapids like Archer Daniels Midland, Cargill, General Mills, Toyota Financial Services and Nordstrom, that’s why the job is abundant and not hard to find here. Life amenities includes 74 parks, two major hospitals, museums and theatres, one of them is the Paramount theatre. Cedar Rapids a.k.a “City of Five Seasons”, for the fifth season is the time to enjoy the other four. Cedar Rapids has a humid climate with long, cold and at often times brutal winters with plenty of snow, while its summers were hot and humid. So if you’re into snow but not for a long time, this place is for you. A fresh start or growing family? West Des Moines can cater to your needs for a kick start. It’s a growing community with a lot of opportunities. The city gives the residents the suburban feel and most of them own their home since the cost of living is low. Restaurants, coffee shops, and parks are just around the corner, everything is at hands reach. Also, the city has an excellent transportation system, with interstate 35, 80 and 235 bringing more business to the city. You don’t have to worry about being unemployed in this place! Great place for the conservative people who don’t like radical scenes. Best known for the Iowa State University the birthplace of Atanasoff-Berry Computer, the world’s first electronic digital computer. ISU has produced numerous Astronauts, Scientist, Nobel laureates, Pulitzer prize winners, and other notable individuals in their particular fields. So if your child is inclined in science you might want to consider the place. The city has 15,000 employees and 35,000 students. A high-spirited neighborhood of student apartments, shops, restaurants, and nightlife. Ames has a vast number of parks and arboretums for people to enjoy. Residents are extremely acquaintable. 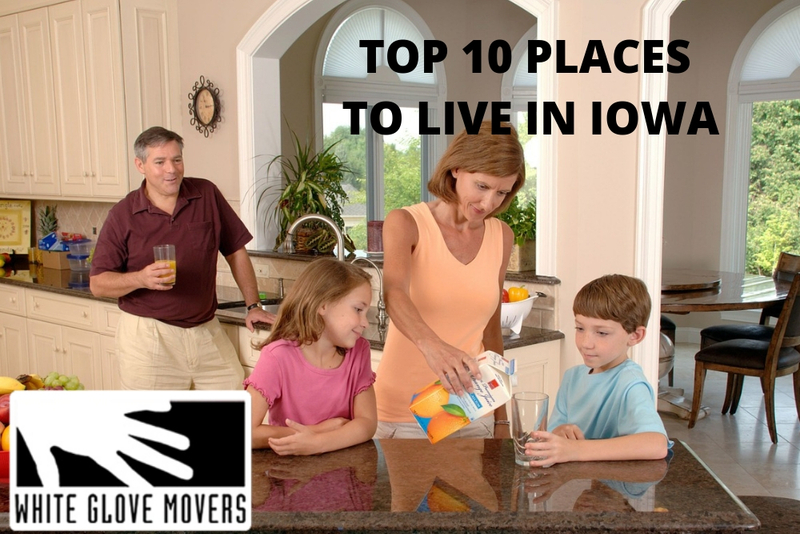 In 2010, Ames was ranked ninth on the CNNMoney’s “Best Place to Live In” list. The capital of Iowa, it ranks as one of the wealthiest cities in America. For people whose mind is into insurance, you should have Des Moines on your list. The city is a major center of the U.S insurance industry, and has substantial financial services and publishing business base. It was credited as the “number one spot for U.S insurance companies” in a Business Wire article. Also, the city serves as a headquarters for numerous companies such as Principal Financial Group, EMC Insurance Group, Fidelity and Guaranty Life, Allied Insurance and a lot more. And because of this, the city has been referred to as the “Hartford f the West” . Business minded? This is a sure win for you. An appealingly charming community that is experiencing a vigorous residential growth, home to the nationally acclaimed Marion Arts Festival along with more than 40 parks and green spaces. The crime rate in the city is very low because of the safety measures that are applied. A peaceful and quiet community to live in. It is a town where you can feel safe to let your children play around without fear. If you’re looking for a secured environment or prefer the relaxing atmosphere for retirement, Marion is your home. Do you need help moving into these places? Contact us to get a quick quote request. We are happy to help.